How soon we take things for granted! These days, it’s easy to find spring-blooming native columbines and their spin-offs. I have so many intermingled, but this is an Aquiliegia chrysantha of some sort. Not so long ago, the only columbines we could buy were foreigners that croaked in 12 seconds. My first ones that worked were simply called “Hinckley columbine” in the days that these native Texans were first coming into the nursery trade. Here’s Aquilegia canadensis. I remember when I bought one of the few rock roses (Pavonia lasiopetala) available at Barton Springs Nursery. I was so proud: I felt like a true plant adventurer. Now you can find them just about anywhere. Winecups in a nursery? A few years ago, not a chance. One blue-eyed grass (Sisyrinchium) came with my yard, but disappeared when the dusty fire ant mounds gave way to grass for the dog. Thanks to its sort-of availability, I’ve restored it in my decomposed granite in the cat cove, since it’s not spring for us without it. These days, some gardeners almost get snobbish about “ubiquitous” native plants. That’s never going to happen to me with my Gulf coast penstemons, this one paired with pink evening primrose. Since we’re all looking for new ideas with native plants, this week on CTG, Andrea DeLong-Amaya, Director of Horticulture at the Lady Bird Johnson Wildflower Center, selects great native options for screens, vines, a sun-loving fern, and nimblewill (Muhlenbergia schreberi), a grass for moist shade to part shade. Here, it’s in one of Andrea’s new stock plant designs-the feathery one on the far left. But what about vines for a narrow space? How about this Purple clematis/Purple leatherflower (Clematis pitcheri)? Find these plants and about a billion more at the Wildflower Center’s Spring Plant Sale on April 9 & 10 (members preview sale April 8; a good incentive to join, or you can do it that day). Closer to the date, check online to see all the plants that will be for sale. And, if you’ve got piles of plastic pots behind your shed, drop them off at the convenient recycling bin for future new plants! On tour, you’ll love meeting Christine and Pete Hausmann! 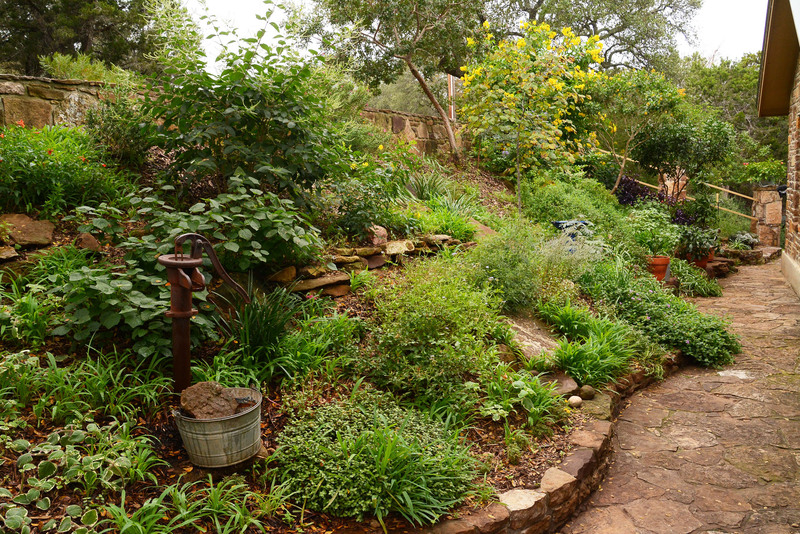 When they bought their house above Long Hog Hollow canyon, they took a new route with their garden: one that respects the land and its wildlife. Their garden, Lazy Acres, is built on creative adventures to celebrate family history, past and present. And check out their darling shed! Inspired by Debra Prinzing and William Wright on CTG’s interview about their book, Stylish Sheds & Elegant Hideaways, Christine & Pete built their own hideaway that 110° August. Daphne answers Jean Wucher’s question: Can she mulch the leaves that have fallen from her native Carolina jessamine? By the way, this is also Daphne’s featured plant: another great native vine for sun to part shade. And YES, you can use your fallen plant leaves as mulch without composting them first. The leaves are already decayed, so there’s not so much a concern about tying up microbial nitrogen activity. Hey, that’s what nature does to feed the soil and improve it! Want to kill off grass/weeds/unwanted plants? Get Trisha’s technique with compost, newspaper, and cardboard. She cautions: do not use slick newspaper advertisements or bleached (white) cardboard. Then, add 1/2″ of soil sulfur to kill the weeds. In normal amounts, soil sulfur acidifies the soil. With 1/2″, it creates a toxic situation for plants, but one that is not long lasting to harm your soil. PLUS: it repels or kills insects. Apply a 3-4″ band at the foundation of your house to deter insects from getting in. Get more insight from Andrea on my documentary, Wildflowers|Seeds of History, which premieres on KLRU March 10 at 7 p.m. (other PBS stations later). Want to know why you often see picturesque bluebonnets in a field of cattle? Andrea explains that and more! This is not a garden show, though there’s certainly fabulous info for gardeners. Mainly, it’s a story of heritage, ecology, folklore, and the significance of wildflowers, through the words of Wildflower Center director Susan Rieff; Damon Waitt, Andrea, and Travis Gallo from the Wildflower Center; Matt Turner, author of Remarkable Plants of Texas; and Dennis Markwardt of TXDOT. And breath-taking high definition video shot by Ed Fuentes!